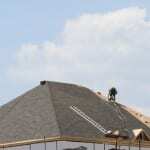 We provide roofing replacement and a number of other roofing services in Angus. The roof on your residential or commercial building does a lot to protect the inside of the structure. Without a roof, your home or office would be susceptible to the wild animals and pests outside, as well as shifts in the exterior climate, including snow, wind, and rain. It’s hard to know for sure when you need roofing replacement since you probably don’t spend a lot of time on the top of your structure. You can keep your eye out for some warning signs, such as damaged portions of the roofing materials on your lawn or landscaping, light patches that come through the ceiling, and excess moisture within your building. These signs indicate that it’s time to get your roof replaced. With the increase in DIY home renovation TV shows, many property owners believe that they can handle the replacement job themselves. Roofing replacement should only be handled by a skilled professional, since an inexperienced person could cause damage to the top of the home or office building. Even climbing to the roof could result in injury or death if you slip off or trip while you’re up there. If you notice these warning signs, or if your shingle roof is more than about 10-15 years old, give us a call at Slippery Slope Roofing to discuss options for roofing replacement. We provide roofing replacement and a number of other services in Angus, Ontario. When you contact us about a replacement service, we’ll send a technician to your property to assess the condition of the roof and make a plan for replacing it.